Carlswald House Preparatory School is a school of great contrasts. It is a small family school which is set in a park-like and tranquil environment, yet it serves one of the most rapidly growing business areas in Gauteng. It is a school whose philosophy values humanity and consideration over materialism, yet it has the facilities and educational apparatus to ensure that our pupils are exposed to the most modern trends in education. We are an independent school registered with the Provincial Education Department, and a member of the Independent Schools Association of Southern Africa (ISASA). On entering our campus, one immediately recognises that our school is a happy place. Our children enjoy coming to school in the morning and they spend a busy day, both in the classroom and on the playground. The relaxed atmosphere belies the fact that an enormous amount of learning is taking place. 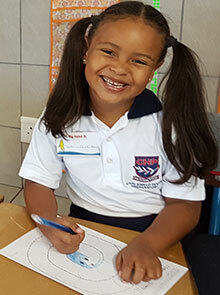 The children are encouraged to develop enquiring minds and the teachers frequently deviate from the curriculum in order to seize incidental learning opportunities. In this way we try to foster intellectual curiosity in each child. We believe that learning should not be a chore – it should be fun! The children at Carlswald House are loved, nurtured and guided towards developing a positive attitude towards learning. In this way we hope to instil in each child the self-belief and confidence to embrace formal education. A great deal of emphasis is placed on promoting and developing values such as integrity, respect, responsibility and trust in our pupils, in order to enable them to, one day, take their place in the world as fully functioning and successful adults. We are growing and tending our future South Africans with care! We would like to extend a warm invitation to prospective families to visit us, and to experience our unique and joyful school. You are sure to leave in a more relaxed and positive frame of mind. Carlswald House is a division of 345 Nursery School which was started as a little play group by Sue Morrison in 1979. After new ownership, together with a couple of years experience, 345 proudly grew leaps and bounds to become the buzzing learning environment. Carlswald House Preparatory was opened in January 2012. Looking for a nursery school in Midrand?